The Institute made the request during a debate on rural development organized by Women 20 (W20), the women’s affinity group of the G20, which will present its recommendations to the leaders of that forum of developed and emerging nations. Panel of experts during the forum held in Salta, Argentina. San Jose, 6 August 2018 (IICA). The Inter-American Institute for Cooperation on Agriculture (IICA) called on countries to urgently develop solid, long-term public policies for the benefit of women living in rural areas. The Institute also cautioned that, unless public authorities and civil society pay greater attention to the vulnerability of rural women, the divide would become deeper, generating painful social consequences. 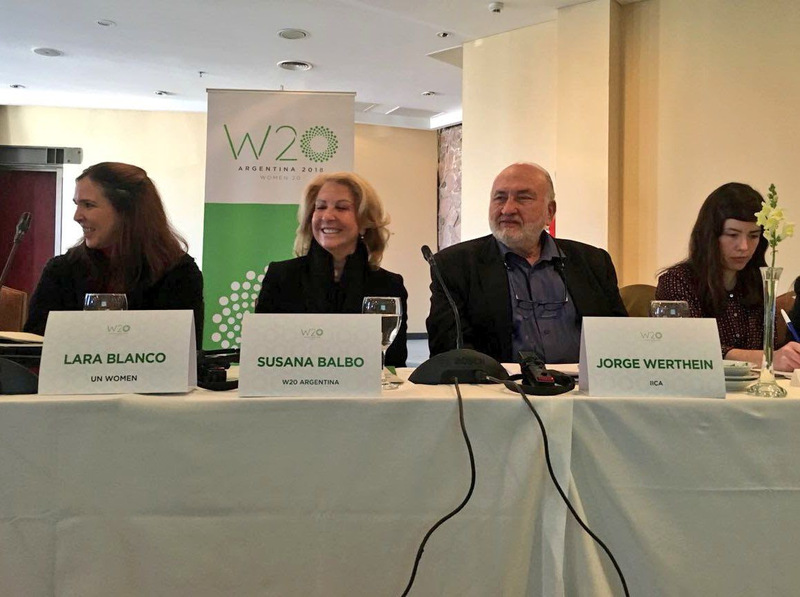 Jorge Werthein, Special Advisor to the Director General of IICA, Manuel Otero, made the statements during a forum on Rural Development organized by Women 20 (W20), the women’s affinity group of the G20. The event, which was held in the province of Salta, in northern Argentina, concluded with a debate on rural women’s social, political and economic inclusion. “Women who live in the rural areas of Latin America and the Caribbean account for more than half of food production. However, they are the most affected by social, political and economic disparity in our countries,” stated Werthein, who urged the attendees to foster the political participation of rural women in order to provide greater visibility for their problems and begin to resolve them through female representation within their communities, in parliaments, as well as in national, provincial and municipal governments. Werthein described the disadvantages that rural women face compared to men living in the countryside, and urban women, by sharing various data on their lack of, or limited access to land ownership, production resources, funding, connectivity, drinking water, education, health and justice. He explained that governments alone were not responsible for bridging those gaps; a commitment on the part of civil society would also be necessary in order to overcome these issues. IICA’s participation in this Women 20 (W20) work session chaired by Suzanne Balbo, a renowned entrepreneur, will allow for incorporating the Institute’s suggestions into the recommendations of this transnational network that brings together women leaders from civil society, businesses and entrepreneurial ventures. The recommendations will be presented to the G20 heads of state and government, who will meet in Buenos Aires on November 30. Lara Blanco, UN Women Deputy Regional Director, and Santiago Hardie, Secretary of Family Farming and Territorial Development of the Ministry of Agroindustry of Argentina, also participated in the W20 meeting in Salta along with other government officials and representatives of international organizations. IICA is the specialized international agency for agriculture in the Inter-American system, with a mission to encourage, promote and support its 34 Member States in their efforts to achieve agricultural development and rural well-being through international technical cooperation of excellence.